I feel like I have started every blog post since early summer with “Back when I was here in 2014….” This will be the last time I do this, as every stop from this point forward will be forging new territory. But as I was saying….“Back when I was here in 2014,” I planned to explore the southern approach into the North Cascades National Park. 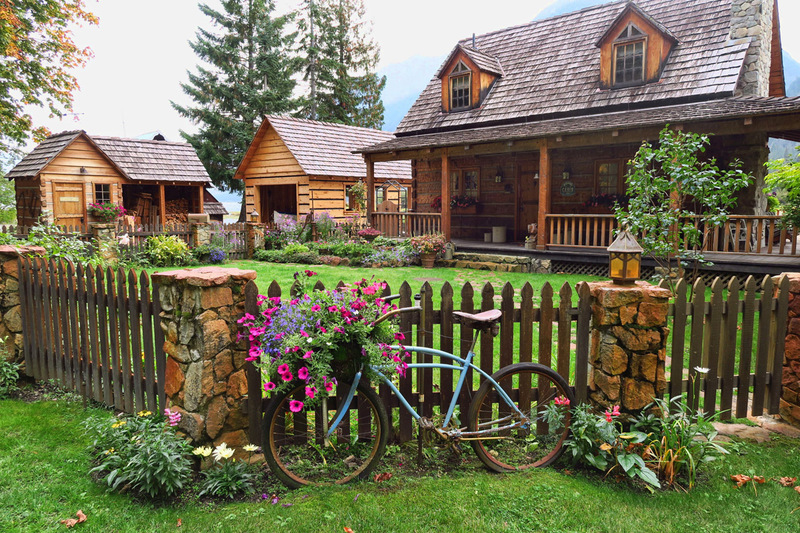 While touring the Newhalem Visitor Center, I learned of a town on the southern edge of the park, Stehekin, only accessible by hiking, float plane, or boat ride 50 miles up Lake Chelan. If one is to hike in, it’s a 30 mile hike beginning at Cascades Pass. There is no type of shuttle service, so this would require a good bit of coordination and more than one vehicle. 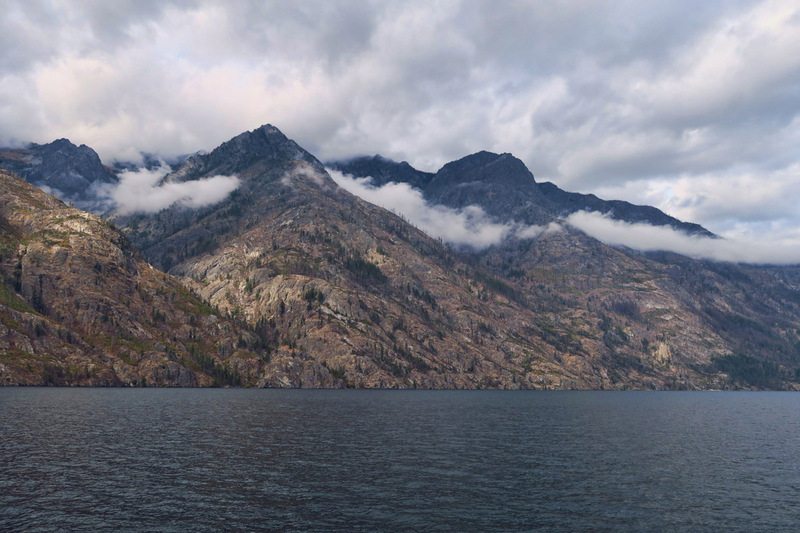 It would also require considerable planning, as a minimum of two overnights would be required to reach Stehekin from Marblemount on the western side of the National Park. Although this would be a dream, I am ill prepared for this kind of hike after sitting out the summer. Float plane would be a fun adventure, but $79 each way makes it a bit pricey for such a short hop. 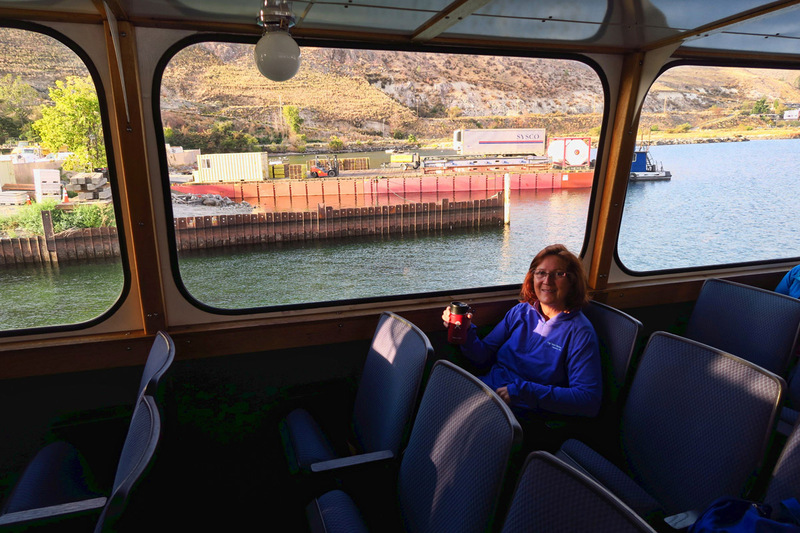 Besides, I wanted the experience of cruising the sites along the 50 miles up the deepest lake in the nation, Lake Chelan. 8:00am is not Don’s favorite time of the day. 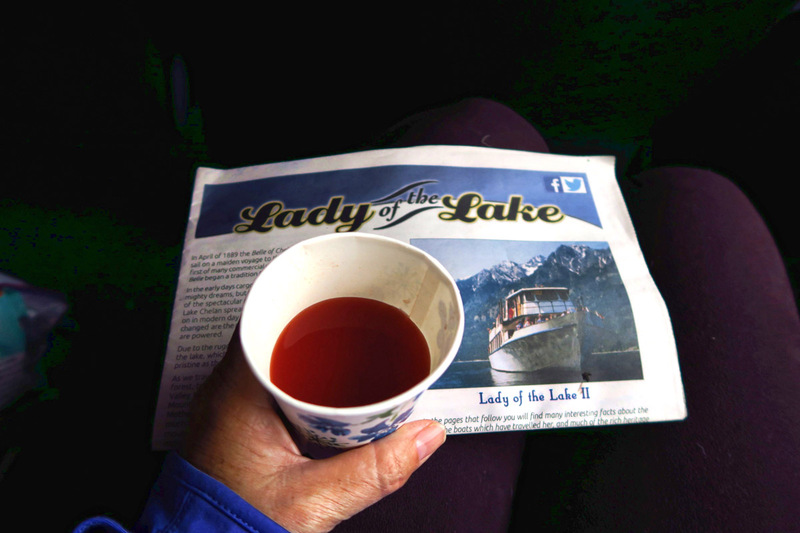 Lady of the Lake II is a very comfortable boat. There are refreshments sold on board, but I BMO thermos. 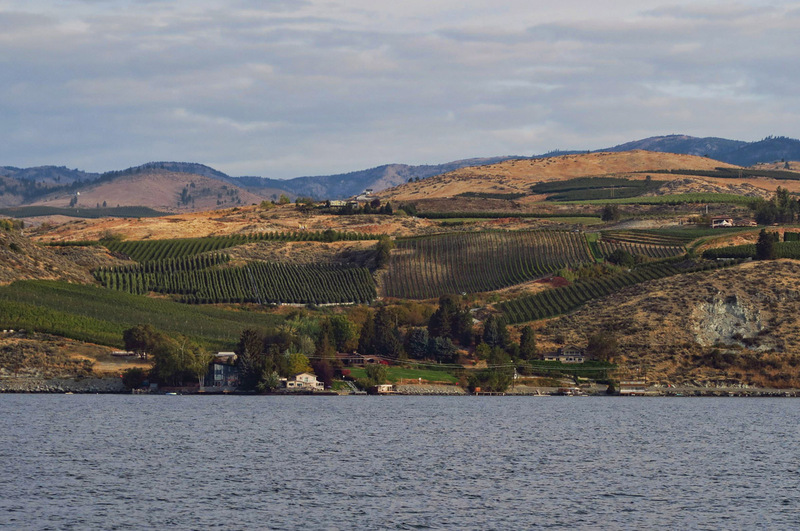 Starting out, we pass many vineyards along the arid valley of Chelan. A few lake houses at the mouth of the lake, before we reach the NP Wilderness. One can drive 10 minutes to Fields Landing and cut an hour off the boat trip. 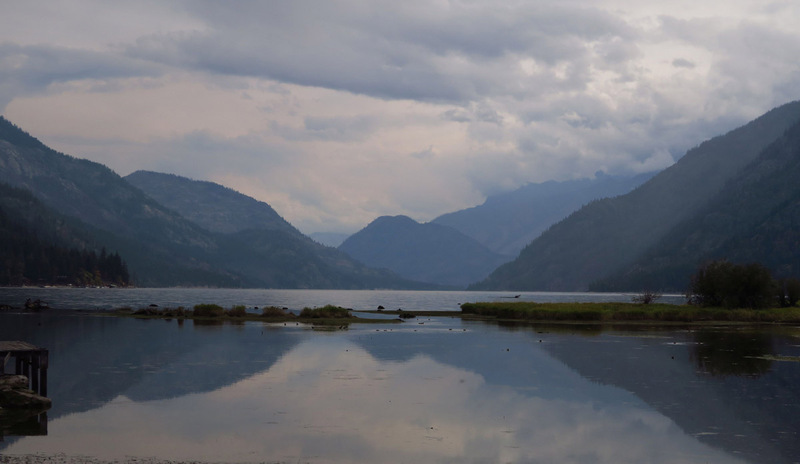 To reach Lake Chelan, the launch point for the Lady of the Lake, one must leave the North Cascades National Park and drive through the Methow Valley, around to Chelan, WA. 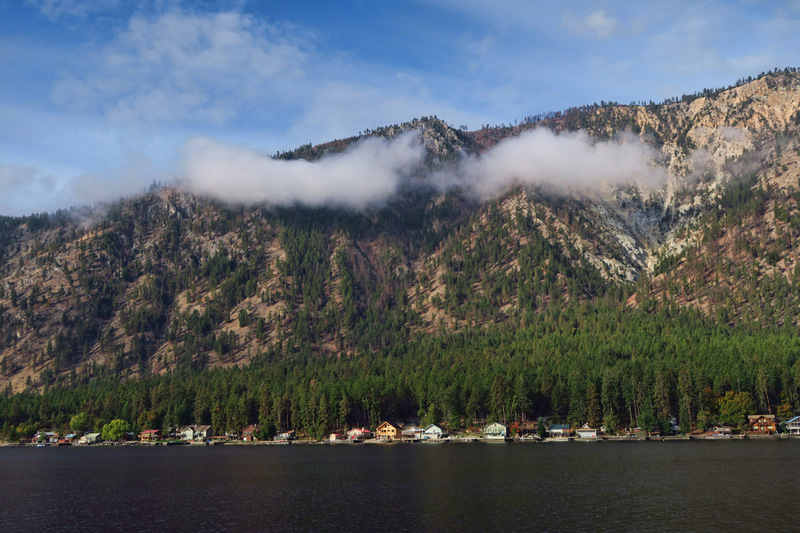 Although Stehekin is only 30 miles from Marblemount “as the hiker hikes,” it requires a 180 mile drive around to reach the mouth of the lake. During 2014, this route was experiencing some intermittent road closures due to forest fires. Still working a 9-5 at the time, I had to abandon my plan to visit for fear of being trapped in Chelan by road closures. 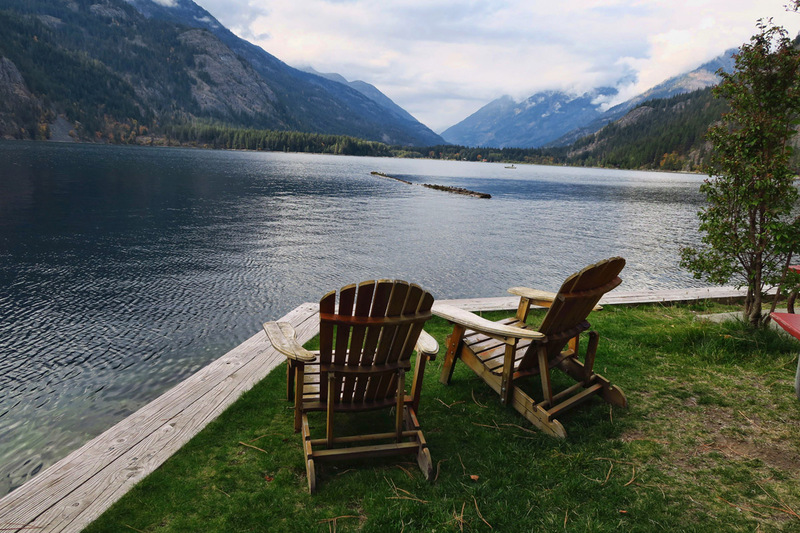 So Stehekin was one of my “don’t miss” stops of this PNW trip. Approaching “The Narrows,” where the lake narrows down to 1/4 mile wide. 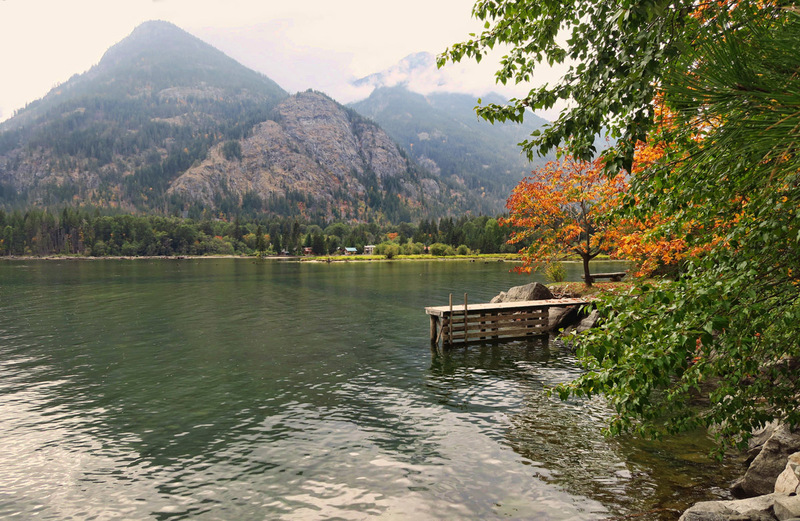 During peak season, there are two boats plying the lake which makes it possible to have a 3 hour stopover in Stehekin. 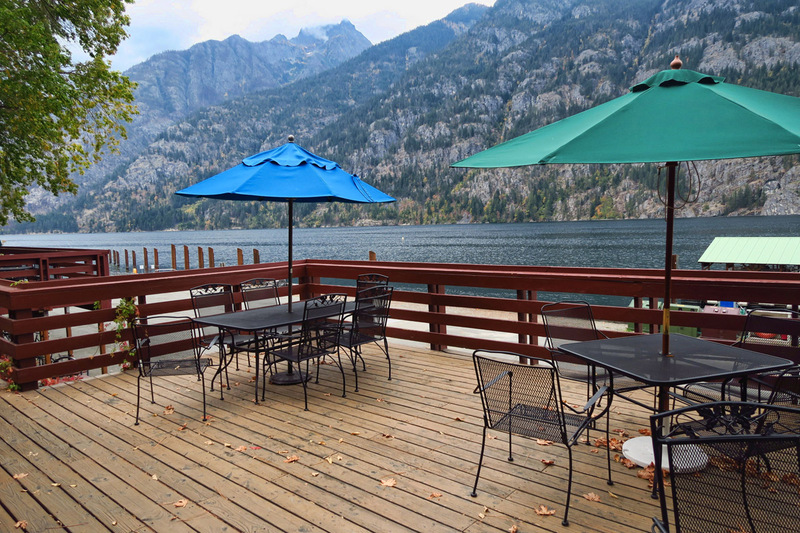 But now that fewer people are visiting in the fall, only one trip per day is operating, limiting the time in Stehekin to only 90 minutes. In order to have more time to experience the area apart from the “daytrippers,” it would require an overnight. 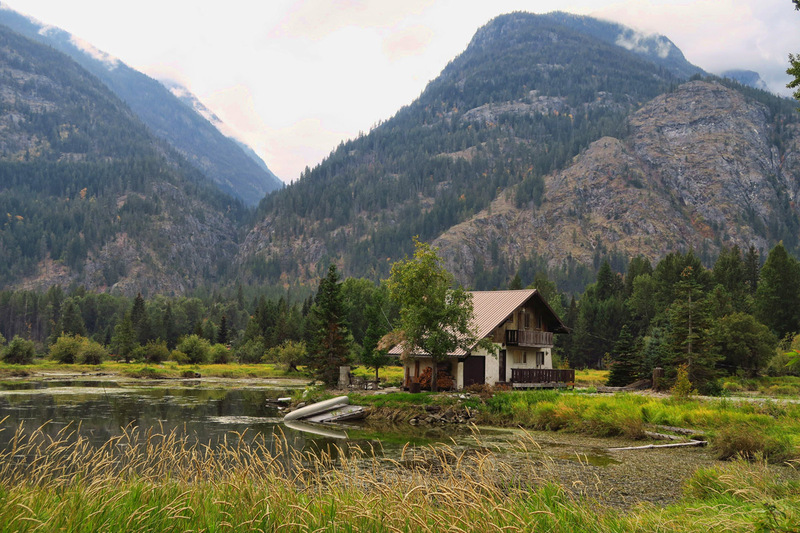 After a lot of research, I finally decided that the North Cascades Lodge would offer the best access for the buck. 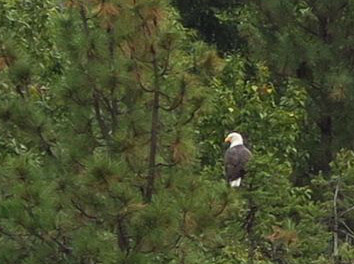 Zoomed in on a bald eagle is spotted along the shoreline. All vehicles, construction materials, equipment, etc. 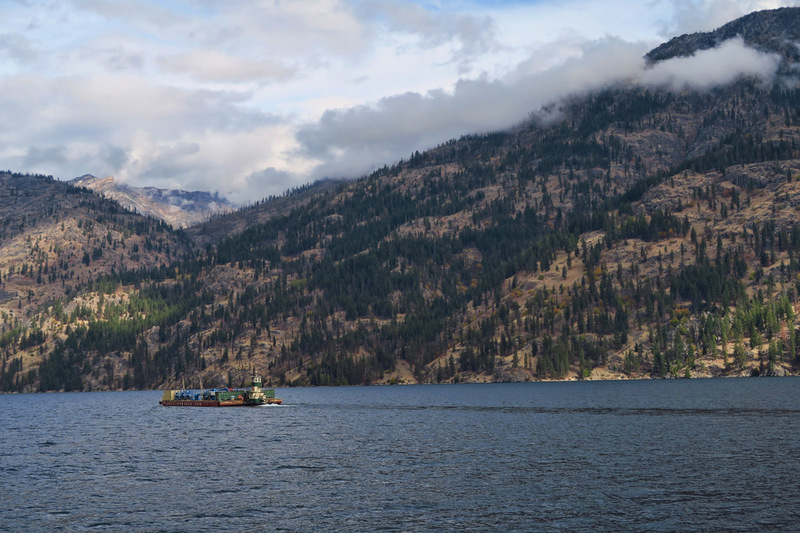 must be transported to Stehekin via barge. We would leave our rigs parked in the lovely BeeBe Bridge RV Park right alongside the Columbia River, thanks to a recommendation from my friend Contessa, who spends winters just 170 mile across the border from Lake Chelan. Beebe Bridge is one of the nicest county parks I have stayed in, operated by the Public Utility District. They offer an off season rate for only $15, with water and electric hookups. So no hesitation in “leaving home” for a night. 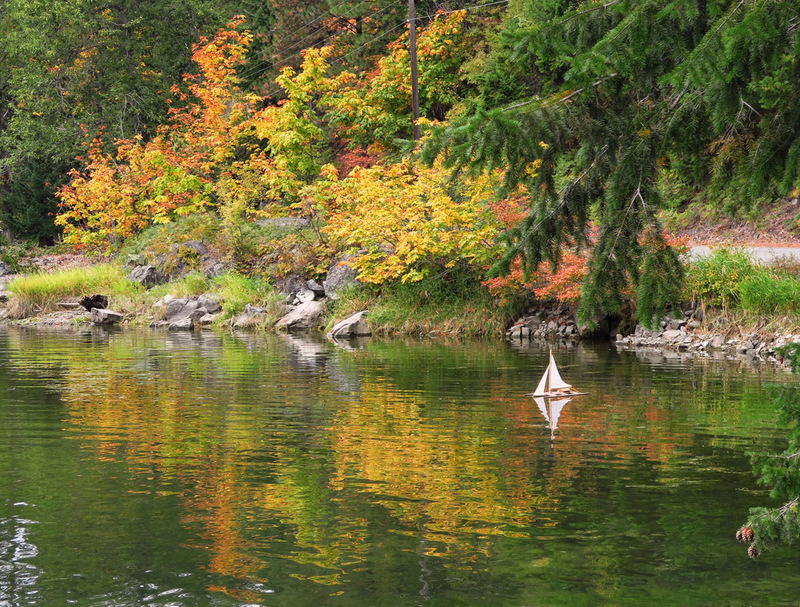 I couldn’t decide which toy boat photo I liked the best, the fall color, or the mirrored lines, so you get them both. The Lady of the Lake II, launched in 1976, is the largest of the fleet and the only boat operating this late in the year. She is 100 ft long and holds 285 passengers, but thankfully today, the boat is only about 20% full. 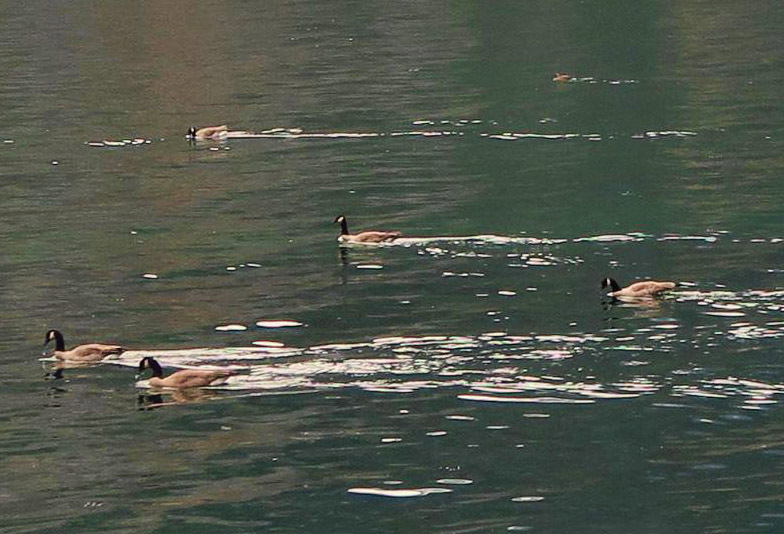 Cruising speed is 15 mph up the lake. During peak season, a second faster option, The Lady Express, cruises at 28 mph with 150 passengers. 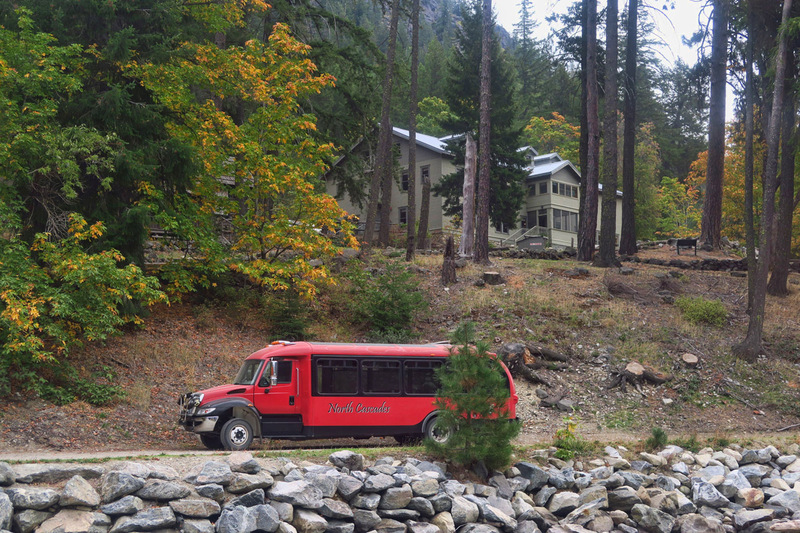 Stehekin “Red Bus” Shuttle in front of the historic Golden West Visitor Center. 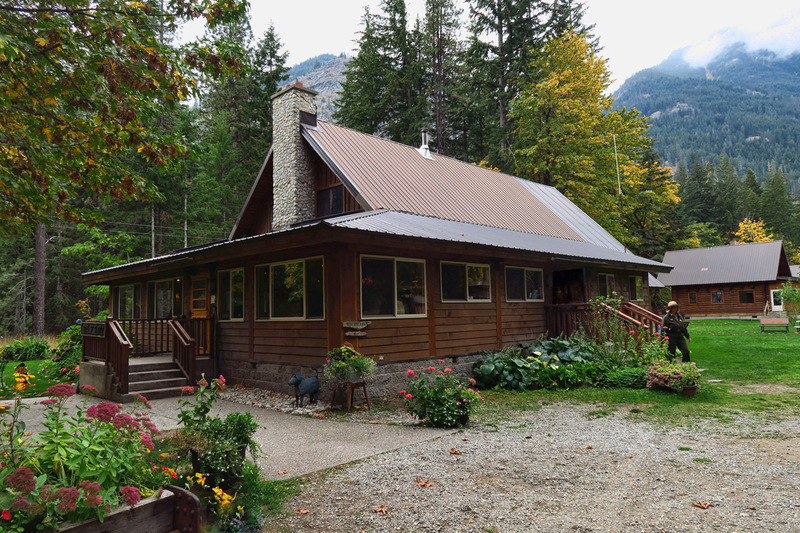 North Cascades Lodge and Restaurant. 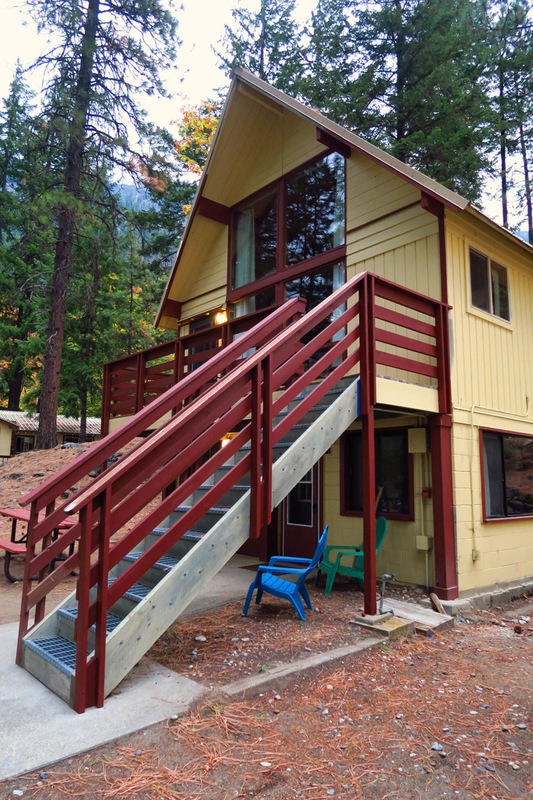 If you opt for the A-frame, I recommend the top floor, lest you get some heavy hikers overhead. We board at 8:00am, which means an early wake-up call for a couple of slow starters. There are snacks on the boat, but we opt to bring our own, and Don whips up a recipe of his famous Bloody Marys to take the edge off what we thought would be a long boat ride. 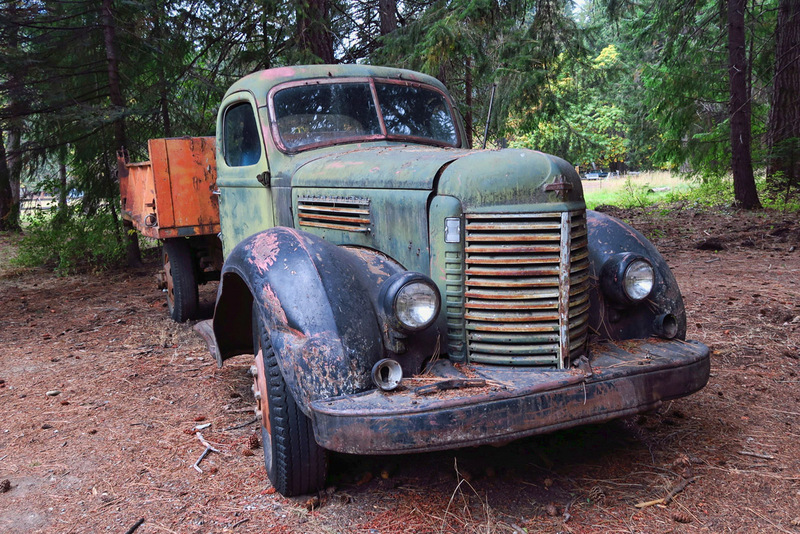 Turns out, the four hours passes in the blink of an eye, as the scenery morphs from the arid lower Lake Chelan valley through the increasingly green lush foothills, gradually probing deep into the stark Cascade Mountain Range where no roads have been built due to the rugged terrain. The Lady of the Lake boat ride is narrated, but not so much as to be annoying. 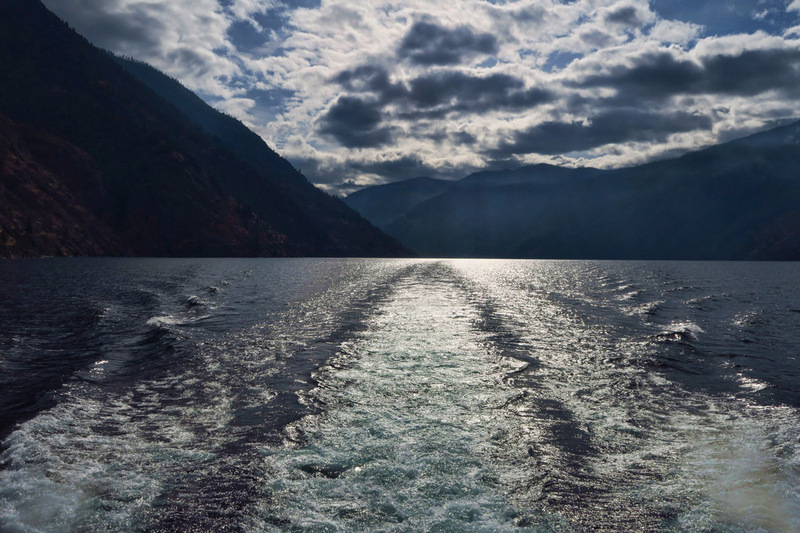 We learn that we will be cruising through the deepest gorge in North America and the third largest lake, only surpassed by Crater Lake and Lake Tahoe. But Crater and Lake Tahoe are 5 and 10 miles across respectively. 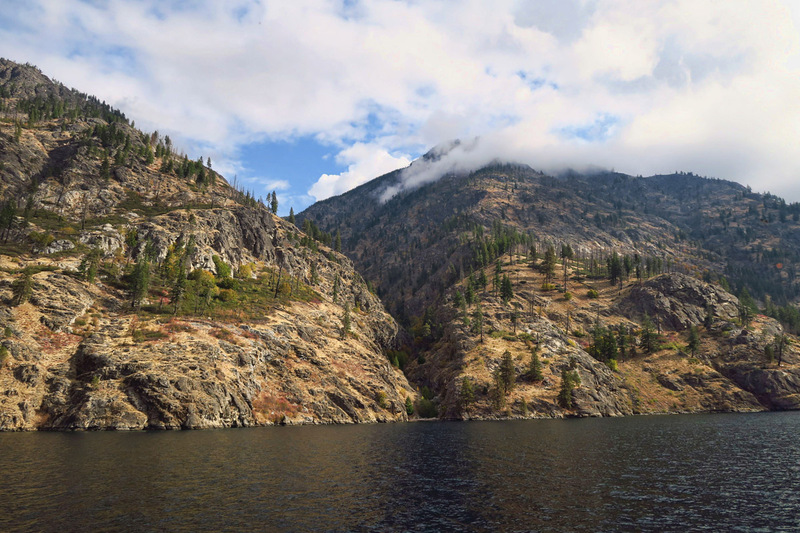 Lake Chelan reaches this depth at only a mile wide, and at one point, narrowing down to one quarter mile across. The lake dips to 386 ft below sea level, making it the deepest gorge in North America at 8,631 ft.
One of the more picturesque houses along the lake. 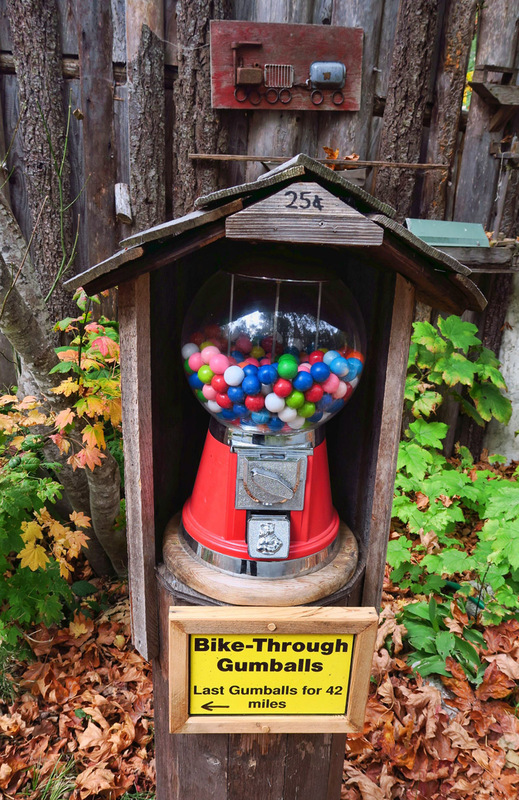 I am pretty certain this sign is accurate…my last gumball opportunity for 42 miles, so I had better partake. 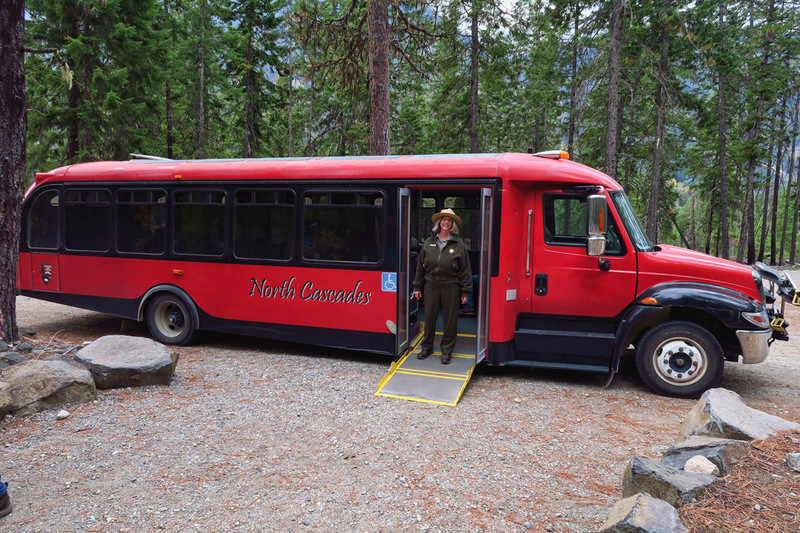 As we arrive at the boat dock in Stehekin, we are greeted by a National Park Ranger standing beside a big red “heritage style” bus with ceiling windows. 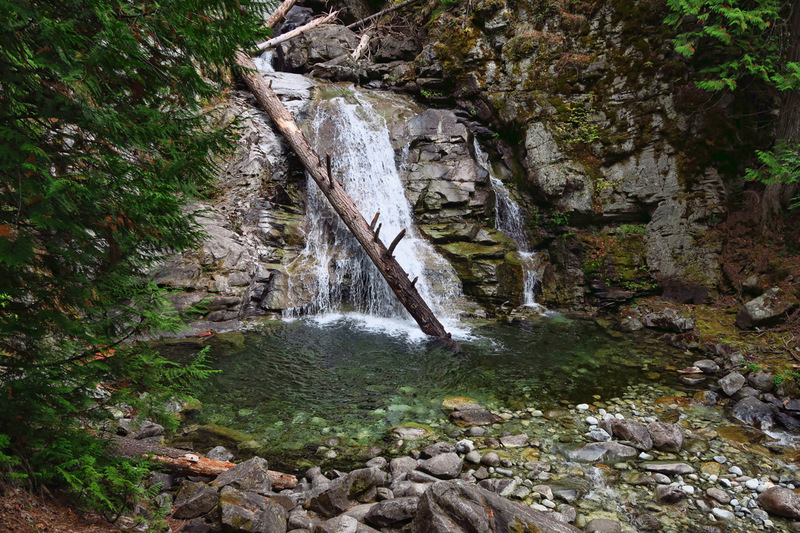 North Cascades National Park provides optional tours for $9 per person, 3.5 miles up the only road to Rainbow Falls, a 312 ft waterfall. North Cascades Red Bus tour to Rainbow Falls. 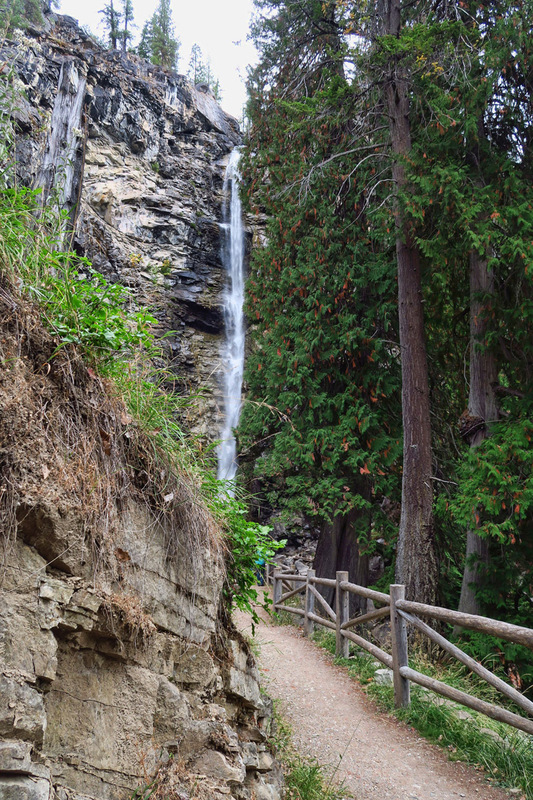 The falls are a little slim this time of year…no rainbows, but still beautiful! Guess which sibling is the extrovert? 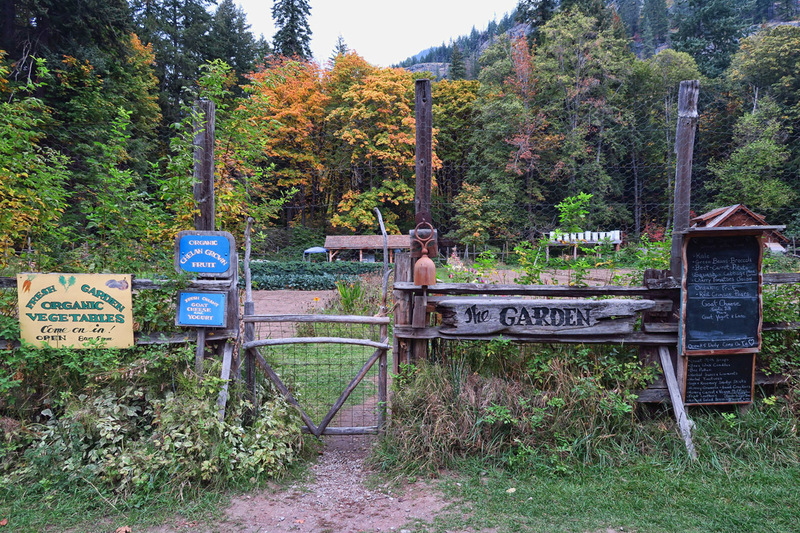 Stops along the way include the one room Stehekin Schoolhouse, in operation from 1921 to 1988. Following the construction of a new schoolhouse, teaching grades kindergarden through eighth grade, the old school was turned into a museum. 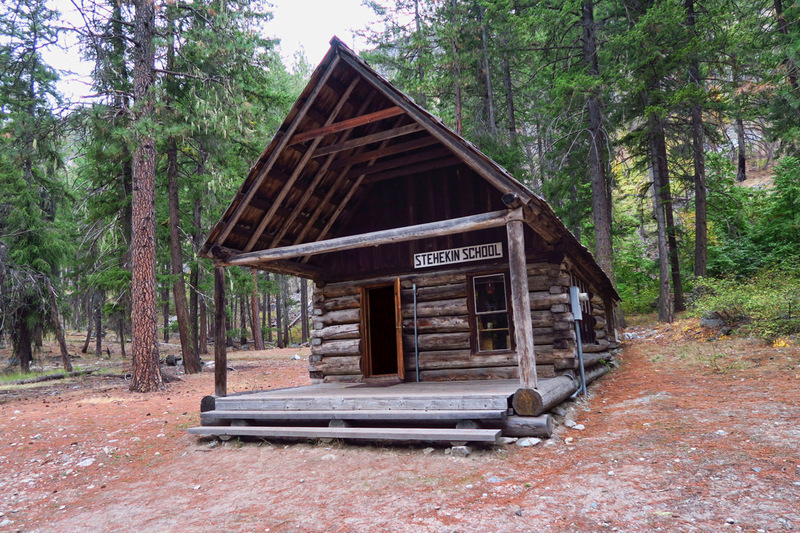 The old Stehekin Schoolhouse, 1921 – 1988 is now a museum. 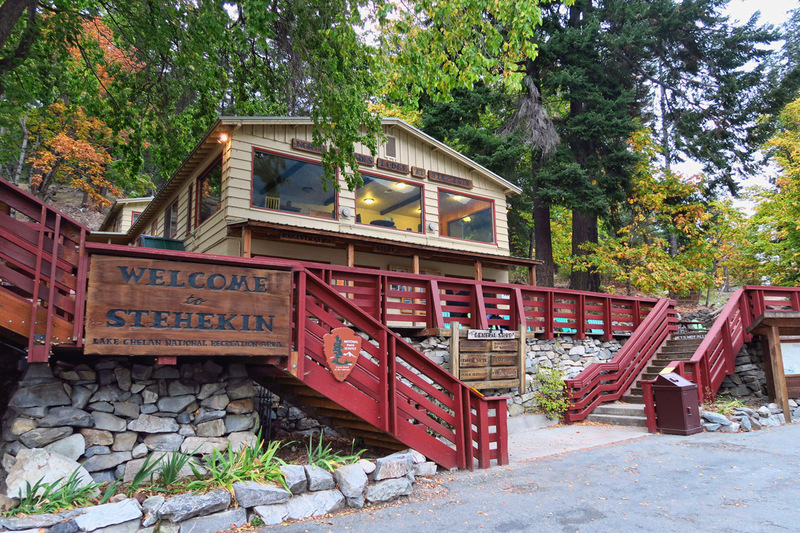 The museum is also used as a classroom for students on field trips to Stehekin. 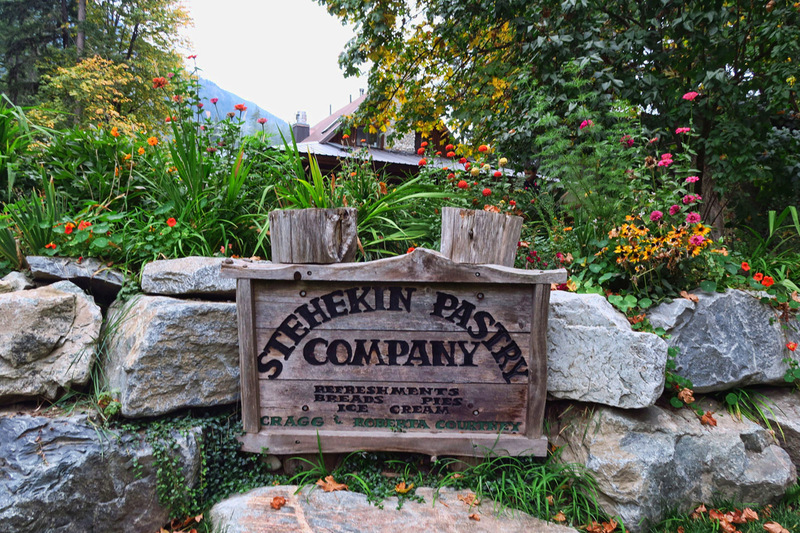 No trip to Stehekin is complete without a stop at the famous Stehekin Pastry Company, in business since 1989. 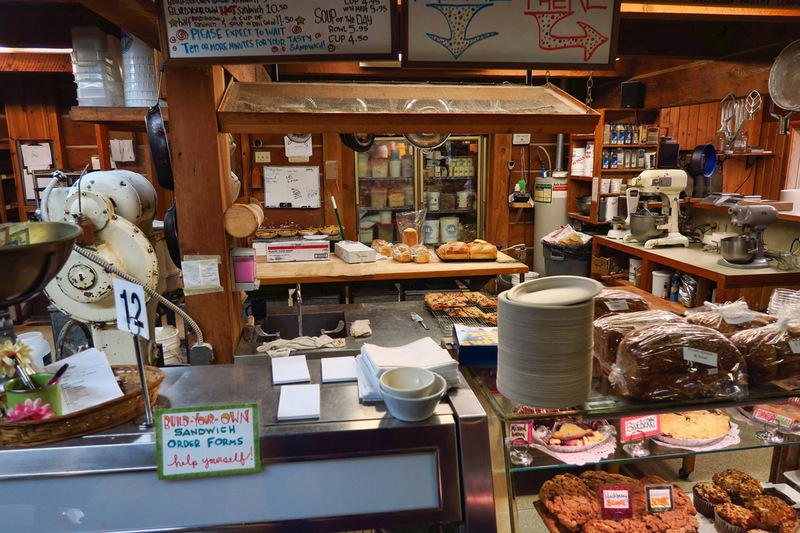 Yet another quaint bakery in a place that by odds, should not be able to support such a plethora of “from scratch” baked goods in a town of this size, regardless of the daytrippers! Pies and pastries made from scratch. 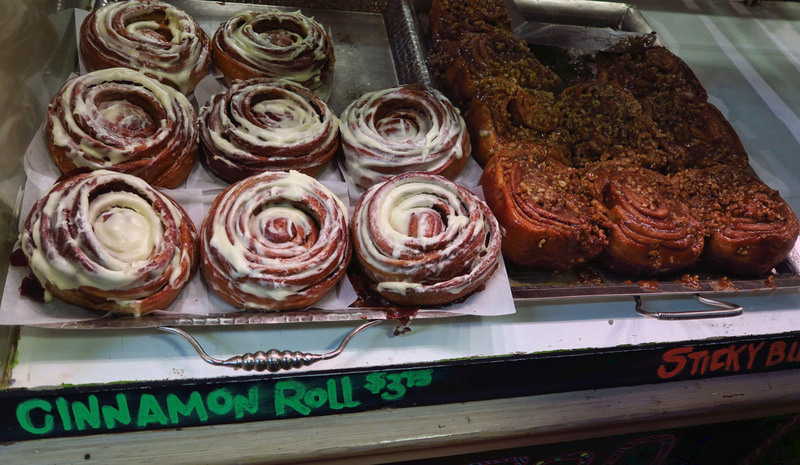 I can attest, the Sticky Buns made a fine breakfast! 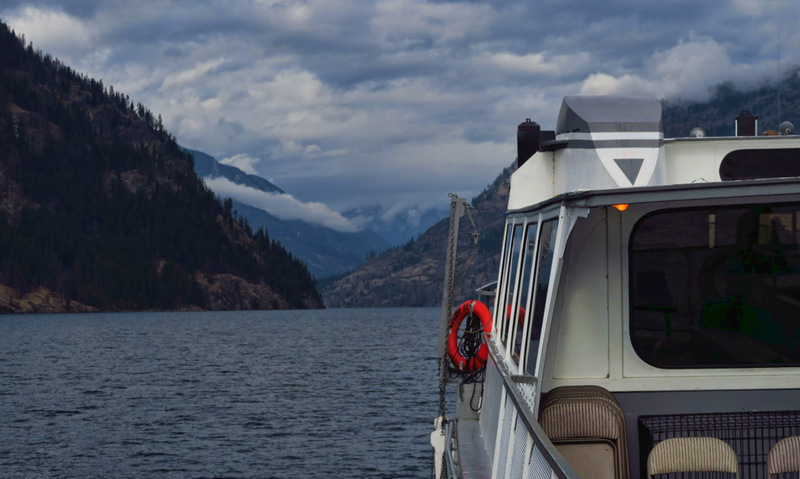 The National Parks tour lasts just long enough for the daytrippers to meet the returning boat down lake, back to Chelan. An immediate unwinding is felt as what “crowds” there were board back on the boat, leaving only a handful of residents and those of us staying overnight remaining. 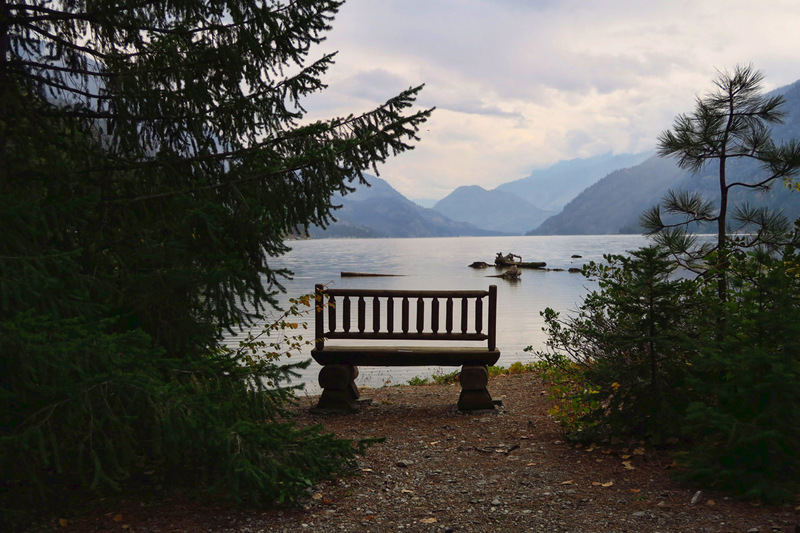 This entry was posted in National Parks, Washington and tagged Lady of the Lake II, Lake Chelan, North Cascades Lodge, North Cascades National Park, Rainbow Falls, Stehekin Pastry Company, Stehekin Red Shuttle Bus by Suzanne. Bookmark the permalink. So, how many mermaids did you kiss?? Sure looks like you guys have been having fun! In Canada, this is called a Bloody Caesar! It’s the Clamato juice…. We lived in Seattle for decades and never did that boat ride. Your photos and narrative are wonderful as always. I’m glad you posted both toy boat pictures. Are these from the new camera? 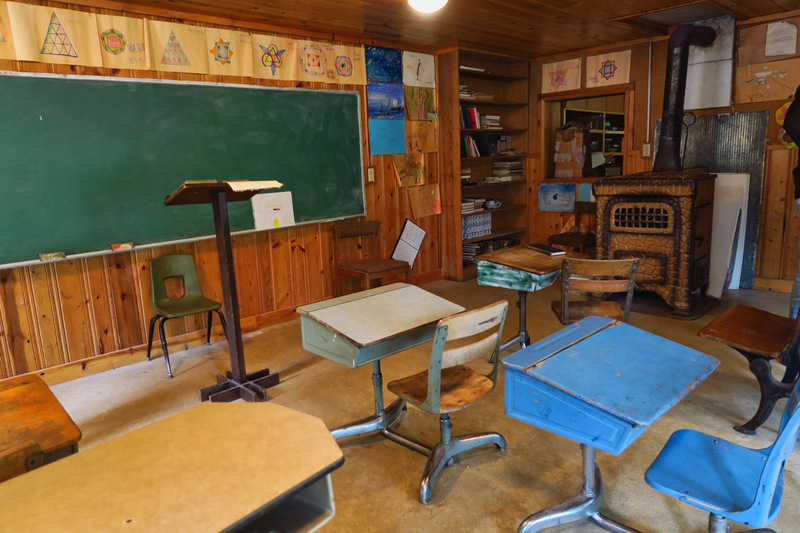 Oh man… you touched so many nerves: The old school house with those ancient desks we used to sit in, the Lodge, the STICKY BUNS!!!. More home turf comments: Our senior sneak in 1973 was on the original Lady of the Lake up to Rainbow Falls for an overnight camping trip. 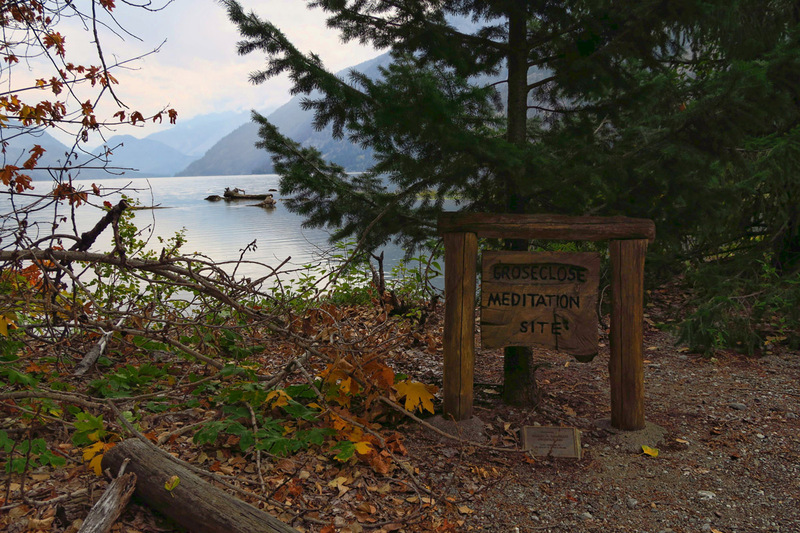 Nothing there then, nada, maybe one building at Stehekin (but that was so long ago and a lot of memory cells have died since then); Stehekin and Rainbow Falls were only accessible by taking a boat up Lake Chelan. We also had family friends from Wenatchee who owned a cabin on the lake, so we spent some summer season time down there, though our lake was much much better for water skiing. 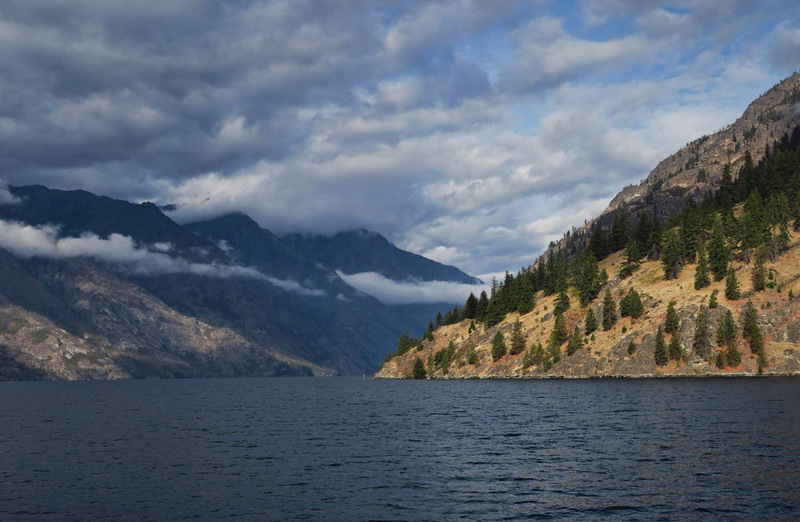 When I was young, the stories were that no one knew how deep Lake Chelan was. 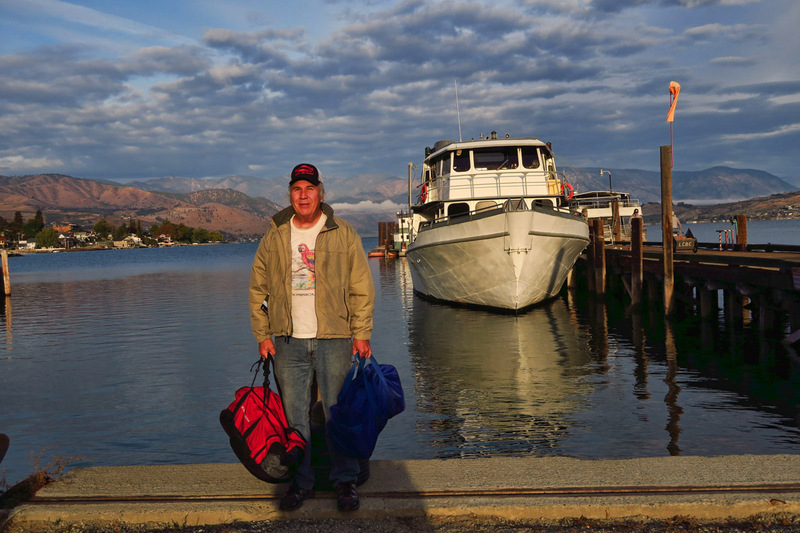 After we were there for a family wedding in 2013 (Pete’s first time there), I looked it up and found that Lake Chelan is one of the deepest lakes in the country, and makes it on lists of deepest lakes in the world. As always, your stories and photos bring fresh information and insight to all those familiar places. Smiling big time! 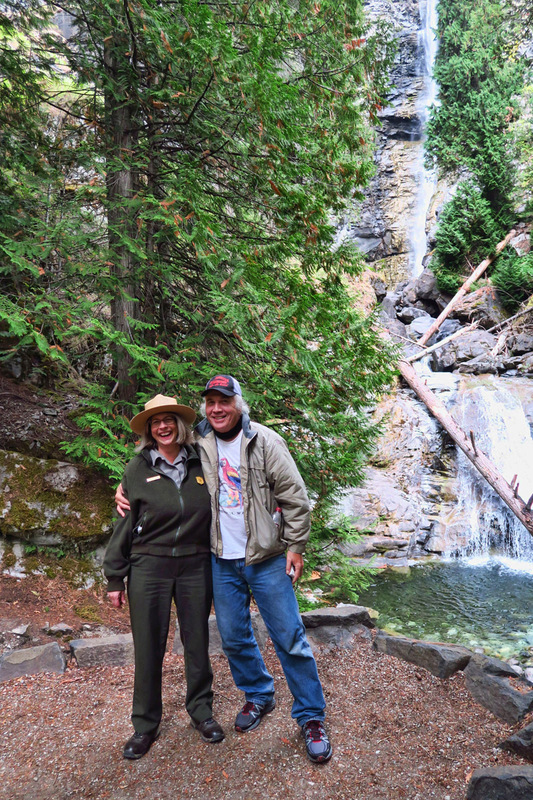 We were able to rent bikes in Stehekin for a ride up to Rainbow Falls. It’s a long boat ride for a day’s adventure. It was great, but I’d want an extra day or two if we do this again. I’m so impressed with you story and photos, we had smoke! it was while the fires were so close. This looks like a lot of fun! Gorgeous scenery. 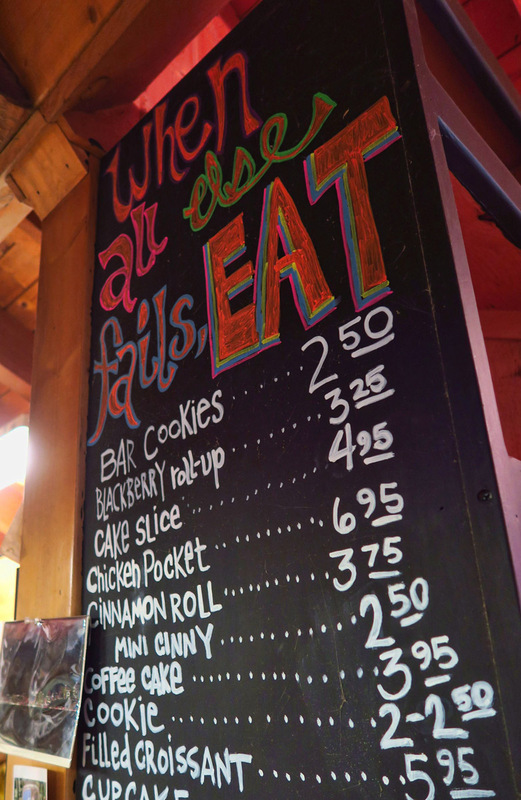 Looks like some hiking is in order to make up for the yummy indulgences! I enjoy reading your blog. Your pictures are great. I would like to be out there rving too. Maybe some day. Thanks for sharing. I remember that bakery from way back. 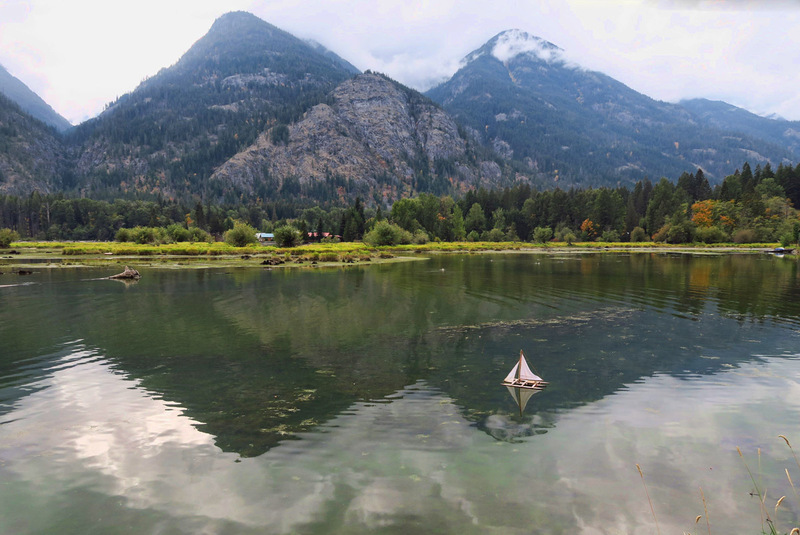 Boat camped along the lake to Stehekin and loved the forests. What a lovely tour! Thank you…. Hi, Suzanne and thank you to Don for the Bloody Mary recipe. So, you did have a nutritious breakfast including tomatoes and nuts. Yes, sirree. Beautiful photos. This part of the country is on my bucket list.